In the morning after breakfast, we grabbed our boxed lunches and headed into Denali National Park. For an early morning guided bus departure that would take us on a tour of the park. Denali is quite different than most national parks in the lower 48 in that you cannot drive most of it by private vehicle. 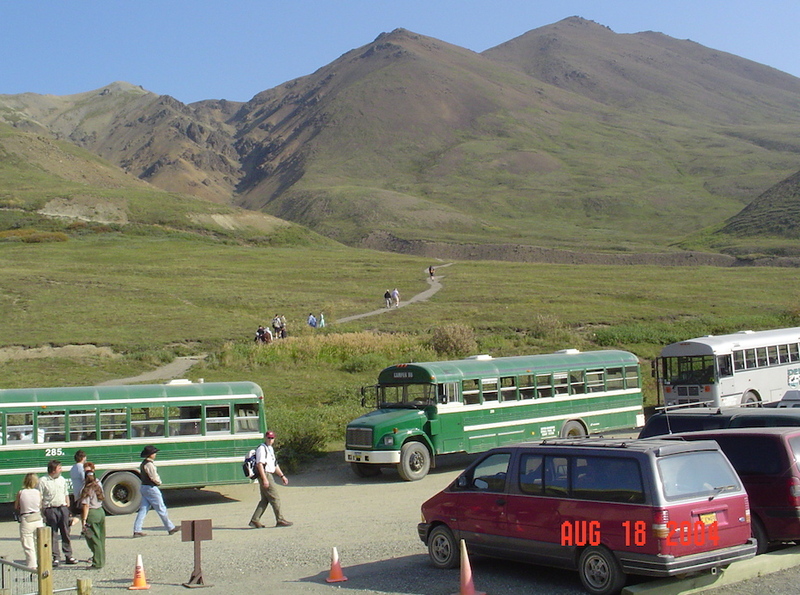 Instead, you must take a bus beyond Mile 15 on the Denali Park Road. Several fully narrated tours of the park are available, and we took on of the most popular: the Tundra Wilderness Tour. 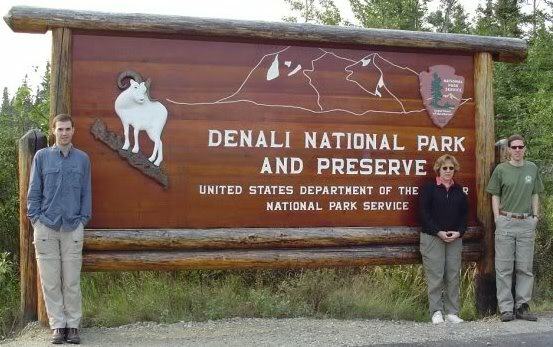 Our tour began at the main Visitor center and took us on parts of the 92-mile-long Denali Park Road, which runs parallel to the Alaska Range. The first 15 miles to Savage River were paved, and our bus pulled over on several pullouts for photos. Around mile 10, we caught a brief glimpse of Mount McKinley shrouded in clouds. Then, we started to see caribou. 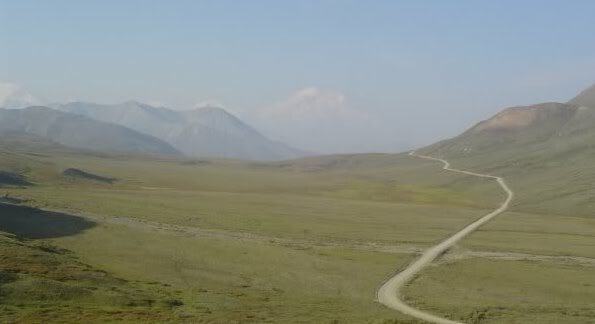 After Mile 15, Denali Park Road turned to gravel and traffic became restricted to buses, mountain bike or foot. Only a small fraction of the road is paved because permafrost would add significant cost to maintaining the road. We traveled through boreal forests and low valleys before ascending high mountain passes and entering the tundra on the way towards the Toklat River. Denali National Park includes more than 14,500 square miles consisting of high mountains, glaciers, forests and tundra. The longest glacier is the Kahiltna Glacier. About 400,000 people visit the park annually to view wildlife, climb mountains, hike, raft, bike, backpack, or practice winter sports. Many ride the buses, like us. Along the ride, we saw a variety of wildlife including grizzly bears, black bears, herds of caribou, moose by streams, hoary marmots and foxes. We saw several interesting birds such as Arctic Warblers, tundra swans, several golden eagles, hawks and a gyrfalcon. At mile 53, we stopped at the Toklat River Contact Station. The views along the river were beautiful. Inside, a couple of park rangers answered some of our questions. As we left and ascended upwards, we noticed that the low tree line in the park. When we crossed at 2,500 feet, much of the terrain turned into vast tundra. 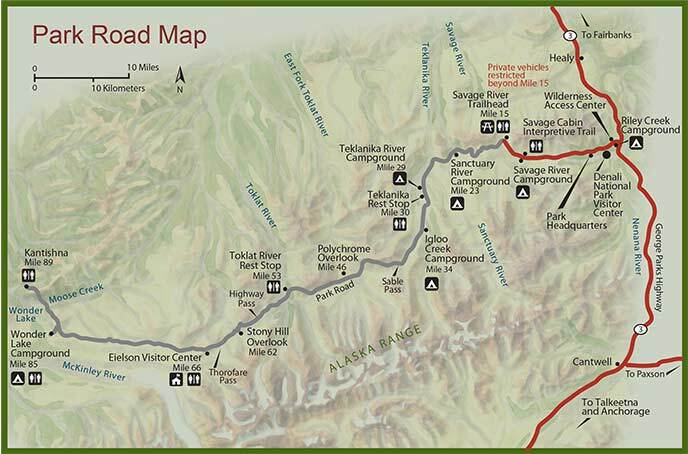 As we climbed up a mountain pass, we arrived at Eielson Visitor Center about four hours after leaving the park entrance, at mile 66. 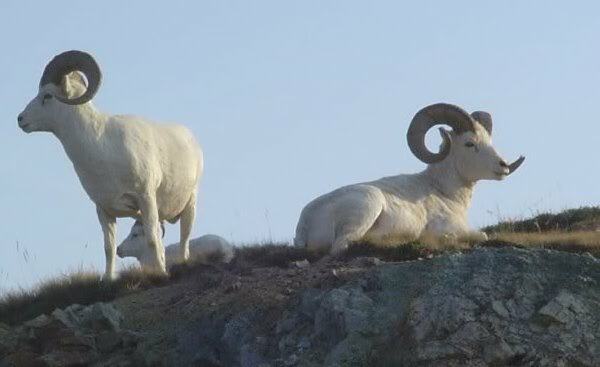 We saw several Dall sheep munching on bushes on nearby cliffs. We listened to some rangers inside talking about the Mt. McKinley and saw some art inside depicting it. As we walked outside, we could faintly see it in the distance. Unfortunately, the largest forest fire in U.S. history was making visibility tough. In Alaska, they generally don’t fight forest fires because the threat of overall damage is usually minimal in such a big state. They just let them burn! Mount McKinley goes by Denali in Alaska, which is the native Athabaskan word meaning “the high one. It is indeed great, with a summit elevation of 20,237 feet. Measured from base to peak at some 18,000 feet, it is also the largest of any mountain entirely above sea level. The summit is unique in that it has two! The South Summit is highest, while the North Summit has an elevation of 19,470 feet. Last year around 58 percent of climbers reached the top. However, as of this year, it has claimed nearly 100 lives of mountaineers. After a 6-hour ride from the main Visitor Center, we reached Wonder Lake. The smoke here was pretty bad, we still had some good viewpoints and saw several grizzly bears. In this western lowland, we saw a number of spruces and willows in beautiful forests near the lake. On a clear day, Mount Denali would be reflected in the lake. We could only imagine it today! We ate our lunch and enjoyed it the best we could. On the way back, we noticed a number of landslides. These were caused by the magnitude 7.9 earthquake from last November. Some German tourists on our tour were obsessed by caribou and yell excitably whenever they wanted to stop the bus for photos. “Caribou am listig … halten sie die autobus!” It was hilarious! It was a long day, but we made it back to the park Visitor Center that evening. We headed back to the lodge and ate a marvelous salmon dinner at the Creekside Café. We talked about our plans for Wednesday, but the smoke was really bothering Mom and me. Dad and Jeff decided to go on a full-day tour and hike the next day, but Mom and I decided to make other plans.